Data is extremely valuable. This should come as no surprise to anyone in business, and neither should the fact that many organisations entertain the thought of selling their data to bring in some easy cash. After all, if data is so valuable and you’re automatically producing it for free, why not get someone to pay you the big bucks for access to it? It’s a great idea, and businesses who think ‘big picture’ about their data are on the right track - but commercialisation is more multifaceted and complex than it’s often made out to be. Let’s take a look at what commercialising your data really means and outline how to determine whether or not it’ll bring value to your business. What is data commercialisation really? Selling your data externally for profit - this is what most people think of when they hear the term ‘data commercialisation’. The idea is that selling access to your data comes at no cost to you and that 100% of the money you get is profit. The icing on the cake is that data is reusable, so you can sell it to many people - again, at no cost. Extracting value from your data internally to benefit customers - there are a number of ways you can use your data to create better relationships with your customers (and thereby ultimately increase profits). An example of this would be a bank doing some analysis on its data and then offering those insights to high-value customers in the hopes that they'll become more loyal or invest more in the future. It’s a less obvious, but in many cases more effective, way to make good commercial use of your data. Using your data to get a better business outcome – analysing and actioning insights from your data to improve operations and logistics, HR processes, category management (etc.) also falls under the umbrella of data commercialisation. If you’re using your data to somehow create value for your business, you’re technically ‘commercialising’ it! In this article, we’ll be focusing on the first iteration – selling your data externally for profit. Data commercialisation isn’t as easy as it sounds. There’s a misconception that external data commercialisation is simple - you just clean up your data, put it out there and someone will buy it, right? Unfortunately, a lot of companies have discovered the hard way that selling your data is rarely this straightforward. Firstly, just because you have data doesn’t mean others will want to buy it - there needs to be a quantifiable value exchange in order for data commercialisation to be viable. Secondly, it’s difficult to actually know how (or even if) someone else can use your information to create value in their business. Yes, data is valuable - but only if it’s clean, structured and usable. Many businesses don't have their data adequately cleaned for internal use, let alone in a state that’s good enough to sell to others. It’s also key to note that industries get differing amounts of value from a certain dataset - perhaps you’ve already got a big bank or corporate paying a certain price for your data, and you’re now hoping to get a retailer on board. Charging them the same amount for that data and doubling your profit might seem like a no-brainer, but it’s unlikely that the retailer will pay the same price for it if the value they get is significantly less than the bank. On the other hand, you might have a dataset that’s actually worth 10x what you think it is to a certain buyer - but how do you determine this from the inside? It’s imperative to understand the value chain and how far down that chain you’re going to capture, otherwise someone who does understand it could capture much more of the value than they should. As you can see, it’s very easy to either over or undervalue a given set of data. In order to get commercialisation right, you need to have a thorough understanding of your data and what it can actually offer someone else. Should I sell my data? 1. How unique is your data? Getting customers onboard works best when you’ve got an uncommon and valuable dataset that isn’t already on the market (if not a monopoly, then close to a monopoly). In short, the value of your data is only as high as its difference from the alternatives. 2. How clean is your data? If your data is in good shape (e.g. it’s been cleaned, organised and structured), great - it’s already significantly more valuable than it would be otherwise. If not, you might need to spend quite a lot of time and effort getting it up to scratch. 3. How stringent are privacy regulations surrounding your data? The privacy and security laws for data sharing vary wildly between organisations and industries - for example, retail companies can be fairly loose with their transactional data (so long as it’s aggregated and anonymised), but banks or insurance companies will need to be much more careful in order to comply with legal regulations governing data sharing. 4. How many viable data purchase use cases can you think of? Try to step back and view your dataset as objectively as possible - how many situations can you map out in which an external company would get enough value from it to buy access from you? Commercialising your data will not work if you can't come up with viable use cases of external parties who would ultimately pay money for it. 5. How are you going to go about commercialising your data? Before jumping in, you need to have a plan for how and where you’re going to sell your data. Unless you’ve got the internal capability and data-sharing platform on which to do this, you’ll likely need to develop a relationship with an external partner - and a strong, collaborative relationship at that. To sum it up, data commercialisation can either be a huge money-maker or a massive flop for your organisation, depending on your current situation and approach to it. If your data is objectively valuable (externally) and in good shape, you can likely see great profit from little effort. If not, embarking on this kind of endeavour could require a lot of work, take a long time and not deliver the expected value or money. 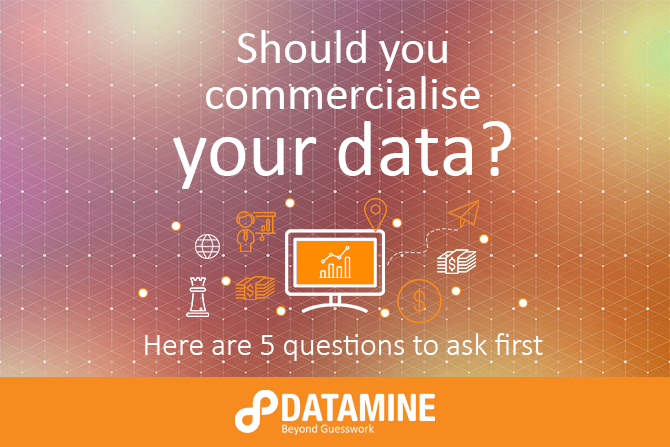 Your answers to the five questions above will be a good place to start if you’re thinking about commercialising your data. The next step is seeking advice from someone who has done it many times before and can assess your situation individually to recommend a course of action. Datamine has been helping organisations across all manner of industries (banking, energy, FMCG, telco etc.) 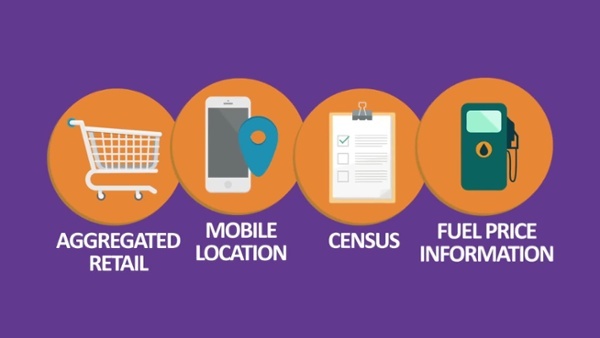 commercialise their data for over 10 years - check out our Retailwatch reports to see one example of how we’ve taken one business’ data and turned it into a valuable asset for a host of others. Curious to learn more? Schedule a free phone chat with one of our consultants below.